Silver Muse is a foodies destination in its own right. 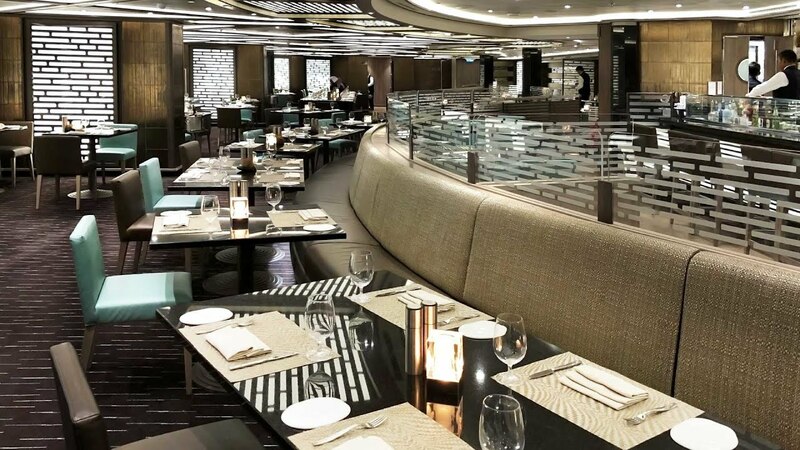 There are more restaurants on this luxury cruise ship than any other. In fact the variety of Silver Muse restaurants is so wide that you can dine in a different venue each night on a typical week-long cruise! La Dame is one of the best fine-dining restaurants at sea and also one of two specialty Silver Muse restaurants. It is an intimate venue serving mouthwatering French cuisine as well as exceptional wines. The menu reflects the best of haute cuisine. Indeed the chefs from Relais & Chateaux® created every dish! In fact the only problem is choosing what to order, but thankfully a welcome glass of Pommery Champagne makes the decision easier. Starters include delicacies like Foie Gras, Scallops or Escargots. While for mains there are treats like Dover Sole, Glazed Perigord Duck Breast and Rack of Lamb. The soufflé in La Dame is not to be missed. I enjoyed La Dame so much I dined there twice. The signature caviar was excellent and served in a quirky, glass hen egg! The Mushroom Veloute soup was heavenly and the Lobster Tail with Leeks in Green Pea Jus was also great. In fact, it made a refreshing change from the ubiquitous Lobster Thermidor served on other cruise ships. Not surprisingly the dessert soufflé is the most popular dish. I enjoyed every mouthful on both occasions! Because La Dame is the smallest of the Silver Muse restaurants (only about 12 tables) there are two sittings each night – one at 6:00pm and another at 9:00pm. If you want to catch the show after dinner you should take the 6:00pm sitting so there’s time to enjoy the dining experience. Also, there are a few other things worth mentioning about La Dame. You can purchase vintage wines from the Connoisseurs list, however the house wine selection in La Dame is excellent. Indeed it’s a cut above the wines served else ware onboard. Also, the staff are happy to match house wines to your meal choices, which is a real treat. It’s also worth noting that you order all courses at the beginning – including dessert. Also, the menu does not change often. In addition, La Dame has a cover charge of $US60 per person. La Dame is only open for dinner and because it is a small venue reservations are essential. Kaiseki is the other specialty Silver Muse restaurant. It is a Japanese teppanyaki-style venue with seating around a chefs hotplate as well as more intimate tables for couples too. The restaurant is open for both lunch and dinner. At lunch time the menu has a delectable selection of perfectly prepared sashimi including tuna, salmon and sea urchin, as well as sushi and nigiri. However, in the evening Kaiseki becomes a fine-dining Japanese restaurant with a set-menu designed to take you on a gastronomic journey of discovery. For instance you can taste the delicate flavours of Edamame Soya Beans, Wakame Seaweed Salad, Pork Belly Bonbon, Black Cod and Beef Teriyaki. They are all excellent. Try Snow Crab Delights served with Wasabi and Topiko Roe in Kaiseki. For starters the Snow Crab Delights served with Wasabi and Topiko Roe was a taste sensation and for main course I especially enjoyed the Miso Black Cod with Fresh Ginger. However, dessert is an underwhelming selection of ice creams. You can have wine or Japanese beer with your meal in Kaiseki, but I recommend you try the Saki (Japanese rice wine). It can be served either hot or cold and is a perfect accompaniment to the delicious meal. Kaiseki is one of the most interesting new Silver Muse restaurants. It is open nightly from 7:00pm. Reservations and required. 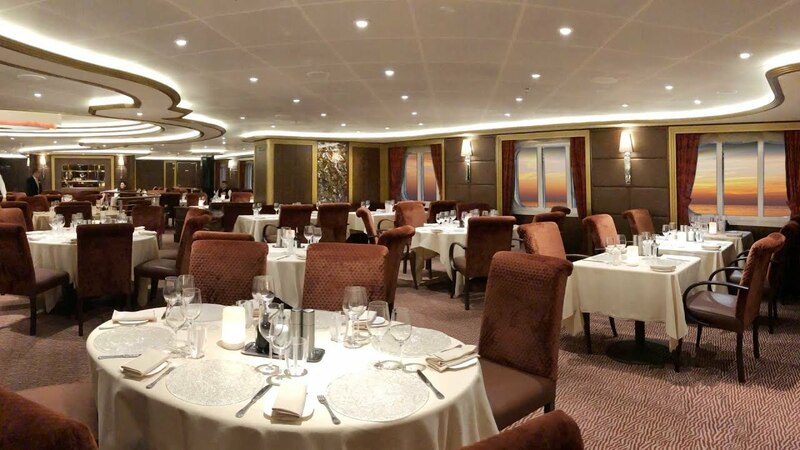 Silver Muse breaks with tradition in that it does not have a main restaurant, however guests seem to have adopted the Atlantide restaurant as their new main dining room. In fact it’s the place to be on glamorous formal nights! Our Silver Muse review explains the formal night dress-code. Indeed, with its high-backed velvet chairs Atlantide has echos of grand dining rooms at sea. However, it also has a modern twist with sweeping architectural curves that add a sense of drama. But what really shines is the food which is fresh, innovative and always beautifully presented. The menu is mostly European and it changes every three days. However there are some dishes that are almost always available, like the Signature Lobster Salad with Zucchini, Beetroot and Sprouts. As we’ve previously reported, caviar is also back on the menu – a welcome addition. 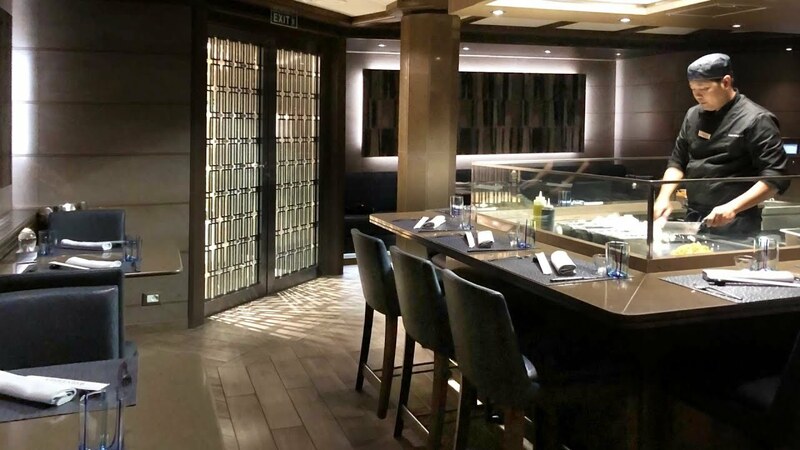 New Champagne, caviar plus ship renovations for Silversea. Caviar is back on the menu onboard Silver Muse. When I sailed on Silver Muse the Leek, Potato & Truffle Veloute in Atlantide was exceptional. In fact it was one of the best dishes I tasted. The grilled New Zealand lamb, served medium-rare, was also delicious and so too was the Italian Veal Chop. Atlantide is the largest of the Silver Muse restaurants and there is seating for groups of up to twelve as well as couples. However, if you’d like a romantic table in a quiet corner simply let the maître d know. The wines in Atlandite are great and include both new and old-world varieties and the sommelier is happy to accommodate special requests. Atlantide is open nightly from 7:00pm. You do not need to make a reservation. The last seating is at 9:30pm. Indochine is an entirely new restaurant concept for Silversea. They call the style ‘pan-Asian’ and there are dishes from as far afield as India, Thailand, China and Indonesia. Indeed, the Indochine menu sets the scene: “Tonight you will not discover Spaghetti, yet a cuisine based on the travels of Marco Polo and more precisely the spices he introduced to the West”. The restaurant has a modern Japanese decor and there is seating for couples and small groups, as well as one enormously long communal table! The delicious Chinese Hot & Sour Soup from Indonchine. The Indochine menu has some delightful highlights. I especially enjoyed the Chinese Hot & Sour Soup based on a vegetable stock with Vinegar, Chilli, Soya and Ginger. The flavours were exquisitely balanced and the spice had just the right amount of kick. Also, the Gado Gado Salad was authentic Indonesian and the Tuna Nikkei with its Rice Wine Vinegar and Radishes was delightfully refreshing. However, some of the other dishes were not as good. In particular the Sweet & Sour Tiger Prawns and the Slow Cooked Veal with Chilli Glaze – both struggled with overly sweetened sauces. Indochine also serve an excellent range of beers from across Asia. They work well with the spicy food, but wines are also available if you prefer. I’m not sure how successfully the fusion of flavours from across the Asian continent work together, but to get the most out of your Indochine experience I recommend ordering dishes as share plates. Indeed, meals in most parts of Asia are best shared. It also allows you to sample the spices and flavours of each region. Indochine is opened from 7:00pm. Reservations are recommended for Indochine. 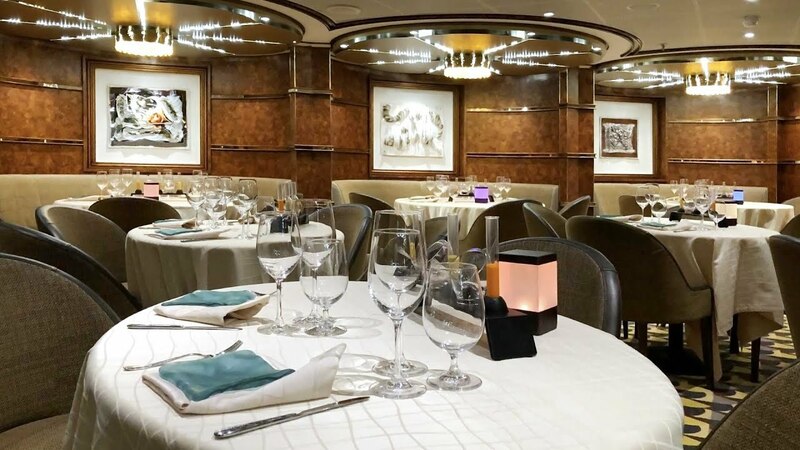 La Terrazza restaurant is a Silversea classic. In fact it pays homage to the ultra-luxury cruise line’s Italian heritage, serving some of the best Italian cuisine on land or sea. This is especially so on Silver Muse. 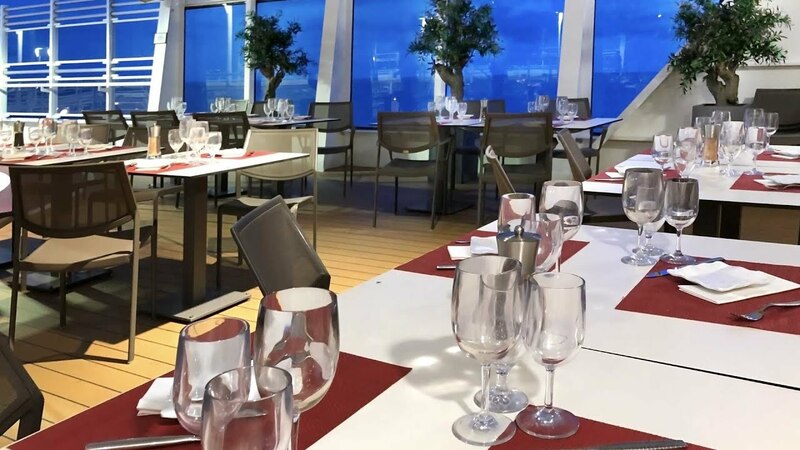 La Terrazza is on deck 8 at the stern and as the name implies it has a magnificent terrace for enjoying sunsets and gentle evening breezes while you dine. La Terrazza embraces the ‘slow food’ movement. In other words, the Italian concept of lingering over long, enjoyable meals. Indeed, the five course dinner menu at La Terrazza is perfect for this. It begins with an antipasti plate including 26-month aged Reggiano as well as Wild Boar Salami, Seabass Carpaccio and other morish bites. A light Capresse Salad with Buffalo Mozzarella or a zesty Octopus Salad might come next – the choice is yours. What ever you do, don’t skip the pasta course! I’m fortunate enough to have eaten my way through pasta dishes up and down the length of Italy, but none have impressed like the pasta in La Terrazza. The fresh pasta makes La Terrazza one of the best Silver Muse restaurants. In fact in La Terrazza the pasta is made fresh every day and there are ten different pasta dishes to choose from, including Papardelle with duck breast ragu, Gnocchi with fresh sage and Lasagne. I had the Pansotti in Salsa di Noci (a traditional walnut sauce) which was sublime. La Terrazza also have a great selection of soups. Indeed the vegetable broth with cabbage and white beans was like Tuscany in a bowl. Main course is a carnivalé of Italian classics. There is Veal Ossobuco, Mediterranean-style tuna with cherry tomatoes and capers, as well as grilled Seabass. Plus there is also an excellent vegetarian selection including Polenta with Truffles and a wonderful Asparagus Frittata. For dessert in La Terrazza the Cassata is exceptional. Desserts are a delight. Tiramisu, Pana Cotta and Lemon Sponge Cake are all on the menu, but I rate the Cassata most highly – a sweet ricotta cake punctuated with little candied fruit explosions. 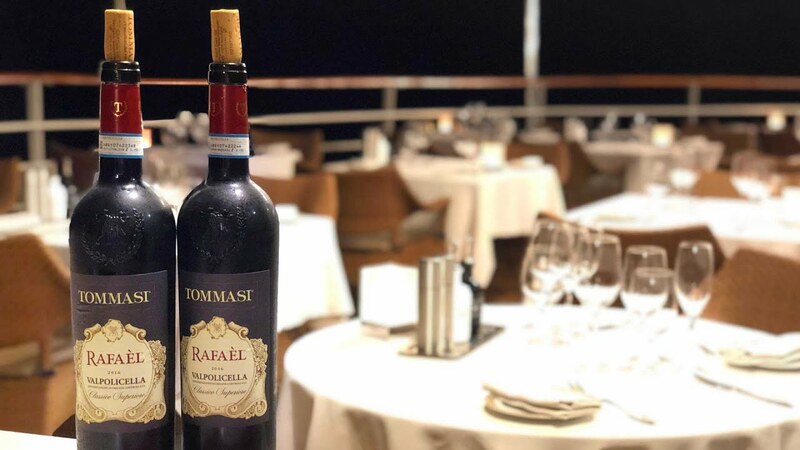 The wines served in La Terrazza form part of a special Italian collection, but most importantly they compliment the dishes very well and you can switch between white and red as you please. La Terrazza is one of my favourite Silver Muse restaurants. It is open for dinner from 7:00pm daily. You will need to make a reservation, but there is no extra charge. The venue also serves a buffet breakfast and lunch. Silver Note on Silver Muse is a jazz supper club. It serves a late night menu in a cabaret setting with the smooth sounds of jazz and blues. The concept is unique to Silversea and it has real panache. In fact Silver Note evolved out of the popular Stars Supper Club which used to be on Silver Spirit. Back then it had a delightful dégustation menu. In Silver Note the menu has changed. Now it offers a small-plate, tapas-style selection which I think works best when shared. There are hot and cold starters as well as larger meat and seafood dishes too. I enjoyed the Octopus with tomato salsa. The seared lamb was also tasty. However, I’m not convinced the menu works as well as the old Stars Supper Club dégustation. Also, the test tubes filled with spicy pepper sauces proved both impractical and unpopular. However, the real star of Silver Note is the music. Indeed, when I sailed on Silver Muse Helene’s smokey vocals enthralled diners night after night. She was supported on piano by Andre whose solos were also spellbinding. Together they proved so popular that many guests would come to listen after eating in other Silver Muse restaurants! Silver Note is a great dining alternative. It is open from 8:00pm nightly and the last sitting is 11:00pm. Seating is limited so reservations are essential. It’s also worth noting the Helene and Andre do not perform on embarkation day. What makes pizzas taste so good in Naples, Italy? Is it because of the thin crust or maybe the tomato sauce? Now you can decide for yourself at Silvesea’s own Naples-style pizza restaurant which is called Spaccanapoli. Traditional Naples-style pizzas are on the menu at Spaccanapoli. In fact the al fresco restaurant has it’s own pizza oven and most importantly, an Italian pizza chef. Spaccanapoli serves Napolitan classics like Pizza Margarita and Pizza Bufalina as well as traditional favourites including Pizza Diavola with Spicy Italian Sausage and Pizza Fungha Porcini. You can order either small or large sizes – I found the small was perfect for lunch. Spaccanapoli is open for lunch and dinner. In fact it serves pizzas until 11:00pm. The dress code is always casual, even on formal nights. The Grill on Silver Muse is a casual poolside dining venue with great ocean views and it also enjoys a gentle sea breeze. In other words, it’s the perfect place to relax over a meal and a glass of wine. During the day The Grill has a buffet selection which is usually themed around the cultures and cuisines of the places you visit. However there are a la cart options as well, like the Classic Silversea Burger and grilled fish of the day. The fish of the day is grilled and served with tomatoes, capers and lemon. In the evening The Grill is transformed. Bathed in the light of a golden sunset it takes on a candlelit ambiance, with table service and crisp linen napkins. A unique hot rocks dining experience awaits. As a matter of fact it is like a table side BBQ where you cook your selection on lava stones heated to 400ºC / 750ºF. There are various meats and seafood to choose from including beef, veal, swordfish and shrimp as well as a vegetarian tofu option. Zesty dipping sauces are available too. The last sitting for dinner at The Grill is 10:00pm. You do need to make dinner reservations, but there is no additional charge. Unlike most of the other Silver Muse restaurants, the Grill dress code is always casual. Read the nightlife section of our Silver Muse review by clicking the button below. The author sailed as a guest of Silversea.